Anaplastic carcinoma – also known as anaplastic carcinoma of thyroid, anaplastic carcinoma of thyroid gland, anaplastic thyroid carcinoma, and anaplastic thyroid cancer – is a rare cancer of the thyroid gland. The cancer arises when genetic mutations transform healthy cells into abnormal cancer cells. Anaplastic carcinoma is one of four types of thyroid carcinoma that affects the thyroid. It is fast-growing and invasive, which makes it difficult to treat. 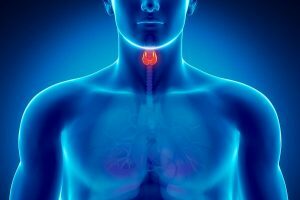 The thyroid gland, a butterfly-shaped gland located in the front of the neck, secretes thyroid hormones that monitor the body’s temperature, heart rate, blood pressure, and weight. Anaplastic carcinomas are allowed to grow and multiply at very high rates. However, unlike normal cells, these cancer cells do not die and they form tumors. The cancer cells can also spread to other tissues or regions of the body, causing metastatic anaplastic carcinomas. The diagnosis of anaplastic carcinoma is often made through a biopsy that is examined by a pathologist under a microscope. The treatment of choice is surgical excision and radiation therapy, but the prognosis is generally very poor for patients with anaplastic carcinoma. Age – Individuals over 65 years old. Personal or family history of goiter – Patients with anaplastic carcinomas have often had long-standing goiters (the non-cancerous enlargement of the thyroid). Radiation exposure – A history of exposure to radioactive materials, or radiation to the head or neck, can increase the risk for this form of thyroid cancer. A possible complication associated with anaplastic carcinoma is the metastasis (or spread) of the cancer to different organs. Surgery – A thyroidectomy may be performed to completely remove the thyroid gland. This procedure is performed when the cancer is confined to the thyroid. It can decrease symptoms of the cancer. When the windpipe is affected, a tracheostomy may be performed to surgically create an opening through the front of the neck and into the windpipe where a tracheostomy tube is inserted into this opening to maintain breathing. Radiation therapy – Used before and after surgery to help shrink the tumor, radiation therapy is a treatment option for individuals with tumors that cannot be surgically removed. This involves the use of x-rays to kill cancer cells. Chemotherapy – Uses drugs to kill any cancer cells present throughout the body, or to prevent the cancer from spreading. It is administered through the bloodstream, and may also help in reducing pain. Anaplastic carcinoma is a rare cancer of the thyroid gland which arises when genetic mutations transform healthy cells into abnormal cancer cells. The treatment of choice for anaplastic carcinoma is surgical excision and radiation therapy, but the prognosis is generally very poor. A possible complication associated with anaplastic carcinoma is the metastasis (or spread) of the cancer to different organs in the body.